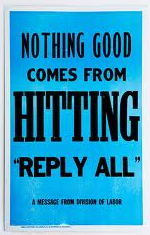 We’ve all hate getting them – the dreaded “reply all” emails. Too often, employees and co-workers continually use and abuse this button, to the extent that email is now “broken” in many companies throughout the business world. Its sad really. One little button can essentially ruin a function that was created to actually save people time. Now however, it is one of the bigger time-wasters in our daily lives. It’s the equivalent to spam in the business to business world – only you can’t opt-out. You can fight back, however, and set up your life to better manage these CC’s (and BCC’s) and get back to the world of the important and urgent. Make people “think” before hitting the reply-all button. Should it go to a shorter distribution list, or does everyone really need to know this? Explore the use of Social tools within the enterprise to try to curb the reliance on Email for non-critical / non-actionable information within the company. To set this up in Microsoft Outlook, go into your rules. You will need to add separate rules for this. This is due to the fact that the “reply” rule is a Server-side rule , and the “Move” rule is an Outlook (Client) rule, and Outlook will not let you build a rule that combines both. But it still works fine with 2. Thanks for including me in your “Reply All” or “CC” email. I like to read these emails once a week (usually Friday afternoons), but sometimes it can take even longer based on my schedule. If there is something “actionable” that needs my immediate attention, please copy that piece out and resend it back to me (directly). Otherwise, I will read your email when I get a chance. The same thing can be done in Lotus Notes as well. However, you will also need to make an Email Agent (since the Lotus Notes rule system does not have an “auto-reply” capability). But it still works pretty much the same – 1 rule to “move” the email, and 1 agent to “reply” to the originator. So, with this rule setup within your company, the next time someone CC’s 20 people, they will in fact get 20 emails back – right now – saying “Thanks! But I won’t be reading this anytime soon”. If it is truly important, it will be up to the sender to re-send the information if it truly needs to be acted on. However, more than likely they will just address the new email to those who need to see it (the remaining 18 people will be spared). AND, the benefit for you is – you didn’t even see the email. Its waiting for you in your “FYI” folder – when YOU are ready to read it. The thing about Reply-All’s and CC’s is that those emails are the pieces of information in the company that could truly benefit from Social tools. If you this in terms of Facebook; what does Facebook really do for you? It keeps you updated on your friends; it lets you see what they are working on; it lets you know their discoveries; it lets you know their challenges. But the biggest thing Facebook does for you is – it lets you do all of this on your own time, when you are ready for it. So twist that around, and apply that to the business world. Reply-Alls and CC’d are an attempt by employees and co-workers to keep you updated; let you see what they’re working on (or did); let you know their findings and resolutions; let you know where they are stuck. It’s essentially the same goals. But when it comes to your Inbox, it does not give you the choice of reviewing it when you are ready. Instead, it often hinders productivity. To resolve that, a tool like Chatter or Lotus Live can help migrate these conversations within a context that matters – a social engagement tool that keeps people well-informed, while preserving the Inbox for immediate and urgent things. Often, my customers will “reply-all” to me. I don’t mind. But I don’t “reply back” to them either. I usually build 2 sets of “reply” rules – one to reply to my internal staff, and the other to simply move the CC or Reply-All email into a separate “Customer FYI” folder. I usually quickly scan those headers once a day, to see if anything really demands my attention. Bottom line for me – Customers always come first, but work needs to get done. I think by creating the proper set of rules within your email system, and engaging in a social tool, will put your company on the healthy path to better productivity. If you would like to discuss your productivity challenges, and get some insight into Social tools that may help your organization, please don’t hesitate to give me a call. IBM has announced a couple interesting items at this week’s Lotusphere – namely, the new “Social” edition of the Lotus Notes client, as well as extended email capabilities within their IBM Connections product (their Social Business tool). I’ve summarized some of the highlights below – if you would like some additional information on them, please don’t hesitate to shoot us a call. Social in the business setting is an interesting proposition. Most notably, it can help larger corporations engage disparate resource teams, and help them better mine innovation that already may already exist within another business unit. IBM’s version of Social is pretty much the same as Facebook – users can make profiles of themselves, tell colleagues “what” they are working on, share files and start discussion threads with specific groups, and so on. However, one thing that sets Social Business apart from Facebook is in the “Activities” department. IBM Connections allow you to create centralized activities, and “invite” other users to participate in the task in a Social way. So if you envision the “email overload” that most companies face, this might just be the solution – If your users can take an incoming email, and turn it into a larger “work effort” through Activities, you can essentially eliminate all of the spreadsheets and “FYI” emails that cripple today’s Inbox’s. What makes this more compelling is that before you were required to have Lotus Notes email in order to “move” an email into IBM Connections. 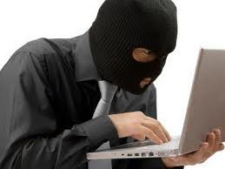 Otherwise, users were required to “copy and paste” the email information inside the Activity. Now, with their direct “Inbox app”, IBM Connections can link directly to the Inbox of Microsoft Exchange as well as Lotus Notes & Domino. So just about any company can now benefit from the Workspaces and Activities apps within IBM Connections. The new Lotus Notes release, called “Social Edition”, has a new feature set called “Embedded Experiences”. This capability should let developers make applications that can “live” inside a Lotus Notes email message. For example – if a customer emails in an order into your Customer Service Inbox, there can be an embedded “What would you like to do?” type application directly inside the email. The embedded application could prompt the user what to do – automatically initiate the order inside ERP, start a new collaborative Activity regarding the order, “snooze it” for later review, and so on. These embedded applications can be dynamic to the content that it is “reading” – so you can make Smart Email by comparing the From of an email with your CRM system, to provide different actions and capabilities for Vendors and Customers alike. Pretty powerful stuff. Also in 8.5.4 will be a Firefox plug-in to let you run Lotus Notes application directly inside the web browser (no conversion required). This can help companies eliminate the Lotus Notes Client entirely, yet still utilize their old Lotus Notes applications unchanged. From what they are saying, these will be standard Notes applications. This poses some difficulty, as a lot of the development in Lotus Notes is now utilizing XPages and Composite Applications. The plug-in will not work for these apps (which is why we believe the plug-in will not work for Lotus Notes email). In addition, it will be a 100meg download – not huge with cable modems these days. But the size is something to consider (to be fair, Java is about 125megs, and Adobe Reader is close to 70megs – so the idea of a “small plug-in” has been abandoned long ago). On a side note, IBM has a new, “slimmed down” license for IBM Lotus Domino. If you have moved off of Lotus Notes email, but still have some applications running inside the Lotus Notes client, the IBM XWork Server allows you to reduce your cost. The charge is $2,000 fixed-price yearly. So if you have over 100 users, this would make sense. Or, if you have an old Domino server that is not currently under maintenance, this is a good way to get back to current without having to repurchase full Lotus Notes client licenses. I read an article on Yahoo News about the French tech company Atos – they are “stopping email” within their company, because the CEO believes only 10% is useful (and up to 18% is just spam). After doing the math, I can’t help but wonder if I am right about what the other “144 useless messages” are. We often find email-overusage in companies that do not leverage proactive systems and workflow. People are programmed to use what you give them. 15 years ago you probably gave them email, and at the time they were sooooooo happy – the end to the voicemail madness! However, in the last 15 years, what additional tools have you given them to organize their lives? We are asking employees to do more and more, but aren’t necessarily giving them the tools to accomplish all of this additional responsibility. Build proactive automation within their CRM system. By pushing key information directly to users, in a just-in-time fashion, users are less likely to “ask” the status of issues, and will not arbitrarily “FYI” everyone on simple mundane issues and tasks. Use metrics to measure everything, and when they fall “out of scope”, only then send an alert of an email. Build a centralized Workflow Portal to capture “everything else”. This would be a spot to capture any work activities executed by cross-functional teams – collaborative proposals, new marketing or product initiatives, cost reduction projects, and so on. These are the places where the “Social Enterprise” should live. Don’t just set up a Wiki, put the Wiki directly within the scope of the project or initiative. To me, email is not the problem. The true issue lies in the fact that team’s need a specific place to put information, and process for collaboration. If none exists, they will leverage the tools they already have – email and meetings. In my opinion, simply shutting off email at Atos will not solve the problem. Instead, users will spend much of their day going desk to desk (or conference call to conference call) “CC’ing” information as they have done before. What is Social CRM? This seems to be one of those questions that does not have a right or wrong answer. I had given this question some thought recently, but had put it on the back burner. Then today, every single CRM website and blog in the world is reporting on the acquisition of Radian6 by Salesforce.com. So I decided to see if I could wrap my head around Social CRM. The nearest I can come to a definition is to say Social CRM is what your customers are talking about. The IT guys are talking IT. Your marketing folks are talking marketing. See how social CRM could mean something different to each individual. I read somewhere that Radian6 has the ability to capture hundreds of millions of conversations each day across the various social media sites. So with all this data being captured and analyzed, I’m guessing that you could get a glimpse of what the various circles of interests are discussing amongst themselves. I’m still trying to figure out how this is CRM’ish and not plain ole data mining? When you find a definitive answer please let me know.